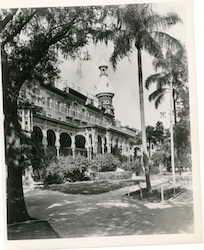 The Tampa Bay Hotel was first opened in 1891 and is the only hotel once owned by Henry B. Plant that is still standing. The Henry B. 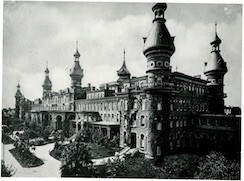 Plant Museum is located on the left wing of the former Tampa Bay Hotel and the rest of the building is now called Plant Hall and is utilized by the University of Tampa. Henry B. Plant was named the “King of Florida” in Success magazine in 1898 because of the growth and prosperity he brought to the state of Florida. The outbreak of the Civil War provided Plant with an opportunity to buy out the southern lines he was already managing for the Adams Express Company. Plant saw the potential that Florida held and post-Civil War he was able to buy up other lines in the south for a great price, bringing the trains the furthest south yet. Plant also earned his wealth owning a steamship line that sailed between Boston, Halifax, Prince Edward Island and Brenton. However, there wasn’t much to do in Florida at this point in time, as most of it was sparsely populated especially south of Jacksonville. Plant found a solution for this problem as well, by building resort locations for people to visit, he owned and operated eight hotels in Florida. The most luxurious of his hotels was the Tampa Bay Hotel, it had five stories and five hundred and eleven rooms. The Hotel cost $2.5 million to build and Mr. and Mrs. Plant spent another half a million decorating it with extravagant and exotic finds they purchased throughout Europe. The Hotel also promised visitors indoor plumbing, electricity, hunting, fishing, boating and sailing. 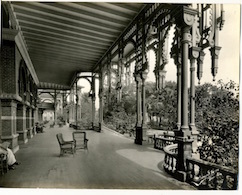 The Plant’s had to make sure their guests were entertained so on the grounds there was a tennis court, golf course, green houses, a casino (Performance Theater), an indoor pool, extravagant gardens and a boat house. Also, guests could take one of Plant’s steamships to Havana, Cuba. The Hotel was only open for the winter season, from December to April. Plant never made a profit from the operation of the hotel but rather from the train tickets visitors purchased from him to get to Florida and the steamships and boats visitors disembarked on from the Port of Tampa. Henry B. Plant connected Tampa to the rest of the country with his railways and opened up a door to further Florida industry. The use of trains allowed for fast export of citrus, beef, lumber, celery, and the “gray gold” of Florida, phosphate which were instrumental to Florida’s economy. The ability to move cargo quickly and without hassle enticed others to move major industries here, such as, the cigar industry. Plant was even able to bring Tampa to national attention, by lobbying for Tampa to be the point of embarkation for soldiers and supplies of the Spanish-American War. 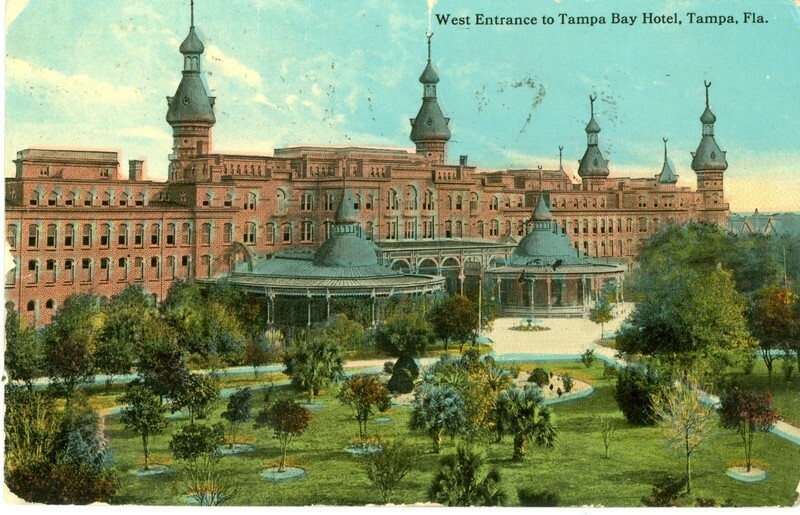 The Tampa Bay Hotel was, even, used as headquarters for the Army officers. 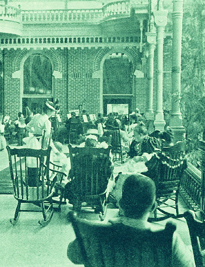 The strategies of the Spanish-American War were discussed on the verandas of the Hotel in rocking chairs while awaiting commands from Washington, thus the phrase the Rocking Chair War. Today, the former Tampa Bay Hotel is owned by the city of Tampa and is leased to the University of Tampa. The University has an open campus and guests are welcome to come and visit and are able to enter the Dining Room, Music Room and Grand Salon as long as the University is not using them. Henry Plant built the Tampa Bay Hotel during the Gilded Ages and to visit was a symbol of one’s wealth but now the Moorish minarets that pierce the sky are a symbol of Tampa. Shana Michaud, “The Henry B. 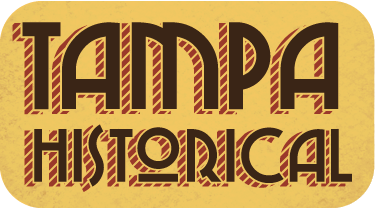 Plant Museum,” Tampa Historical, accessed April 20, 2019, http://tampahistorical.org/items/show/35.